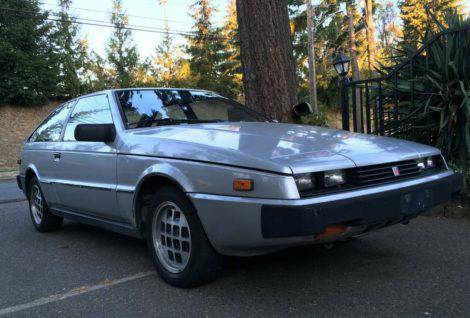 This next car comes from Matt C who writes: OK, it's a non running car and not the easiest thing to get parts for... but it's a very cool '80s Italdesign styling exercise, and you'll have the only one on the road. If you get it on the road, that is. It is rear wheel drive with a wide engine bay, which would make it an interesting engine swap candidate. Find this 1984 Isuzu Impulse offered for $800 in Atlanta, GA via craigslist. So I gather that this has an impulse engine and not the warp drive? Is there room in that "wide " engine compartment to swap in a Dilithium-focused matter/anti-matter reaction chamber? The blades out of your Cuisinart? This Isuzu got me thinking about the VW Corrado. Did they all basically fall apart? They are pretty hard to find in any kind of nice condition. A friend of mine had a vr6 that was super fun to drive. They're still around, they just never sold that many to start with so finding one in good, original condition is rare. Funny that the Impulse made you think of the Corrado, since most people accused it of being a Scirocco knock-off! Here's one in Seattle. It's a VR6 SLC and not a G-lader G60. Is that Isuzu Joe in the ad?! I was helping push my cousin out of a snow bank in her '87 Impulse once and was completely baffled when the rear wheels started spinning and chucking snow into my face. I had no idea these were RWD up until then. For that fact alone (ok, and the 'handling by lotus' badges), I'd buy one. I was a high school kid in the 80s (class of '87) and I remember these cars. One of the rich popular kids in school drove a turbo model and I thought it was awesome. It's worth noting that these were not exactly "bargain" cars in the 80s. That ad posted by Sean Scott above, the middle one, touts a 1989 base model model starting price of $14,239, with the Turbo starting at $16,239. According to the US Bureau of Labor statistics inflation calculator, that is $29,204 and $33,280, respectively, in 2017 dollars.